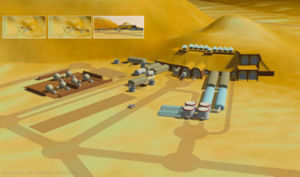 Rendering of the first permanent Mars Settlement. The Hillside concept originates from the primary design of human settlement on the surface of Mars by the Mars Foundation™. Known as the Mars Homestead Project™ this concept utilizes local materials where possible and proposes energy generation by nuclear power. The Hillside design maximizes protection from solar radiation, insulation from the extreme low temperatures and low Martian pressure. 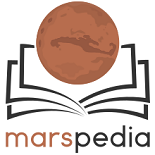 On analysis of possible settlement locations, Candor Chasma (part of the vast Valles Marineris canyon system) was selected as an excellent candidate for the Hillside concept.